months the matter of finance and bullion becomes a question of serious consideration, particularly when one has to borrow all he "lives, moves and has his being" on. 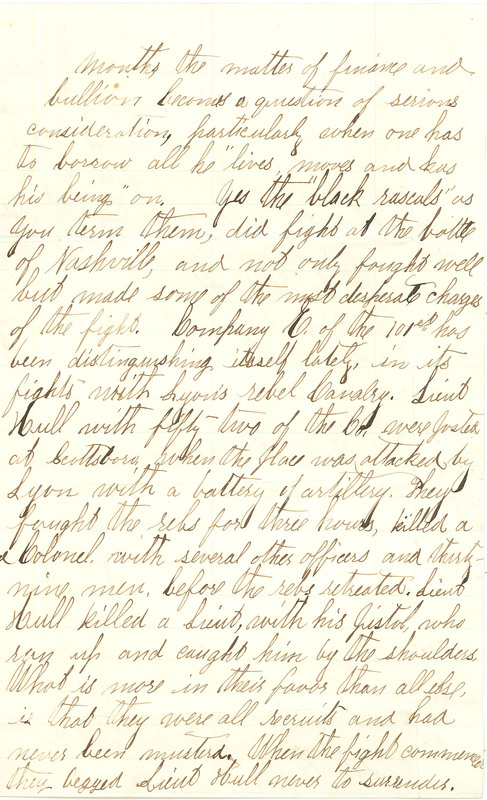 Yes the "black rascals" as you term them, did fight at the battle of Nashville, and not only fought well but made some of the most desperate charges of the fight. Company E. of the 101st has been distinguishing itself lately, in its fights with Lyon's rebel Cavalry. Lieut Hull with fifty two of the Co. were posted at Scottsboro, when the place was attacked by Lyon with a battery of artillery. They fought the rebs for three hours, killed a Colonel, with several other officers and thirty-nine men, before the rebs retreated. Lieut Hull killed a Lieut, with his pistol, who ran up and caught him by the shoulders. What is more in their favor than all else, is that they were all recruits and had never been mustered. When the fight commenced they begged Lieut Hull never to surrender.